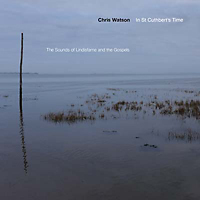 In St. Cuthbert’s Time: The Sounds of Lindisfarne and the Gospels is a set of conceptual field recordings made by noted wildlife / BBC sound recordist Chris Watson. Employing nothing but captured soundwaves and photographic images, Watson transports the listener far away in space and time. The place is a tiny island off of Northeast England containing a Christian monastery. The time is the seventh century, smack dab in the middle of the Anglo Saxon Period. While the bishop of Lindisfarne, Eadfrith, sits snug inside the monastery writing a richly illustrated book of the Christian New Testament called the Lindisfarne Gospels, the sounds of the natural world ebb and flow all around him. As a steady drone of crashing ocean waves roars in the background, “Winter” really brings on the birds in the form of ducks, Greylag geese, Brent geese, whooper swans and wigeons–all of which warble and chirp away. Spurred on by a stalking fox, the bird and ocean sounds coalesce into a hectic and strange sonic web. You are currently browsing the archives for the Chris Watson category.